Queen is one of the biggest bands in history, so it begs the question: why on Earth has it taken so long for there to be a film about them? A biopic of the group, and its legendary frontman Freddie Mercury, had been in development for the better part of the last decade, first announced in 2010 with Sacha Baron Cohen in the lead role; but when Cohen dropped out, citing creative differences between him and surviving members of the band, director Dexter Fletcher and star Ben Whishaw came on board to steer the project in a direction more suiting to the band, only for them to later drop out too. It wasn’t until director Bryan Singer and Mr. Robot star Rami Malek replaced Fletcher and Whishaw respectively that the long-gestated project finally went into production – but even then, the nightmare wasn’t over; Singer was fired during filming for not showing up on certain days as well as alleged on-set quarrels with Malek, with Fletcher being brought back to finish the remaining scenes Singer didn’t complete (though the latter still receives a director’s credit, having filmed the vast majority of the film before being let go). So, after all the trouble and turmoil it took just to get Queen’s story onto the big screen, is Bohemian Rhapsody worth all the hassle? Sort of; on the one hand, it’s certainly a by-the-numbers musical biopic, playing things perhaps a bit too safe and conventional for a band that was anything but safe and conventional; but on the other, it’s thrilling seeing some of their biggest hits recreated for our viewing pleasure, especially in a lead performance that easily carries this movie across all its other, glaring flaws. We follow Queen’s rise to music infamy through the eyes of Mercury (Malek), born to immigrant parents from Zanzibar as Farrokh Bulsara, who discovers his future bandmates Brian May (Gwilym Lee), Roger Taylor (Ben Hardy) and John Deacon (Joseph Mazzello) one night in the early 1970s after performing in their band Smile. Farrokh – renaming himself Freddie Mercury – begins fronting the band when their lead singer quits, and a combination of their music and Mercury’s flamboyant stage persona help gain them more attention, including EMI Records who signs the band, now known as Queen, on to make hits like “We Will Rock You”, “Love of My Life”, and of course their six-minute opus “Bohemian Rhapsody”. Meanwhile, as their star rises, Mercury begins to discover that he is, in fact, gay and not truly in love with his female companion Mary Austin (Lucy Boynton), leading him down a darker and ultimately more tragic path as the band rises more and more into a state of notoriety. There’s really nothing in this movie that sets itself apart from many other musical biography films like this; you’ve seen this kind of movie before, about the lead singer of a popular band who gets so big they end up casting aside their band mates for a greater shot at glory, only this time the band in question is none other than Queen. You’re not going to get anything that’s necessarily groundbreaking about this group or its members, with a lot of the story and its twists and turns being ones you could easily look up on the Internet when researching their history, and for something that took a lot of time and difficulties to actually put in front of a camera, you can’t help but feel like you could have gotten something a bit more than the standard biopic formula. There’s a scene in the film where Queen are making an argument to the head of EMI (played by an unrecognisable Mike Myers) that sticking to formula is a waste of time, yet they’re saying that in a film that sticks so closely to formula it’s practically glued onto the thing. I understand why they took this direction, because after all Queen doesn’t necessarily want to make themselves look too bad, but what you’re left with is a film that could have been great if, like the band, they actually broke some of the rules and played around with some of the tropes, in a manner that would have the late Mercury looking down with pride on his former band mates. As conventional and safe as the movie is, it would be a complete damp squid if not for Rami Malek’s ferocious, flamboyant and fiercely entertaining lead performance. The actor bears a striking resemblance to the man himself, especially when you see him later in the film sporting his iconic moustache, and even sings a lot like him too whenever his voice isn’t clearly dubbed over by Mercury’s real vocals, but beyond all of that it’s a remarkable piece of acting that sees him go through all the motions, from his early displays of outward eccentricity to his eventual diagnosis of AIDS during the 1980s, and he delivers it with such warmth and energy that he easily becomes the film’s saving grace whenever it tends to fall back on some of the more stale biopic clichés. Needless to say, he’s the best part of the movie, and almost makes you forgive the rest of it for not entirely living up to expectations, especially seeing how this is about a band and its lead singer who redefined what it is to be a normal musician. 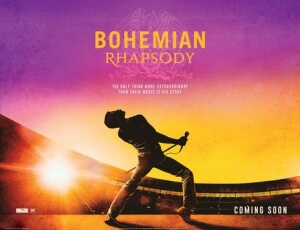 If you’re a huge Queen fan, then I think you will like the movie just fine; as standard a biopic as it is, it’s cool seeing their biggest hits being performed by these actors, especially the exceedingly game Malek, leading up to a grand finale at their Live Aid performance in 1985, which like the singer himself is big, extravagant, and full of life. It’s just a shame that the rest of the film couldn’t entirely live up to those standards. Bohemian Rhapsody will certainly please Queen fans, even though it does fall back on safe and conventional biopic tropes more often than not, but even that is forgiven by the astounding lead performance by Rami Malek as Freddie Mercury.